-- You Have A Choice--Get The Essentials Needed For The Workforce (A Degree and Skills)! 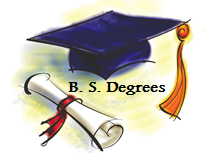 -- The Division Offer The Top 50 Degrees And Certifications For The Future! The mission of the Division of Business and Information Technologies (housed in the Dr. Perry W. Ward Building) reflects the application of Lawson State’s overall mission to the field of Business and Technology. To accomplish this mission, the Division offers programs to provide students with specialized training and skills that will enable them to become employable and competent in their discipline, provide students with skills that will allow them to matriculate successfully in a four-year college or university setting, provide knowledge and skills that will prepare students to function as intelligent citizens and consumers in a business-oriented society, and meet the special needs of the community; a Small Business Development Center that offers services to entrepreneurs so they can build a growing and stable platform that will enable them to expand; assistance with campus online courses using BlackBoard and registering them as a Southern Regional Electronic Course (SREC); and various areas of training to business and industry and the community. We specialize in providing state-of-the-art, highly marketable programs. According to the Occupational Outlook Handbook, the skills obtained from our highly skilled instructors train individuals for more than 250 occupations as well as refresh existing skills. The curriculum provides students with a broad understanding of business, accounting, office administration, a competence in business computer programming, and knowledge of information technology infrastructure. DISTANCE EDUCATION COURSES - The Business and Information Technologies Division offers selective distance education courses in every degree plan. The Distance Education program at Lawson State Community College is designed to provide online educational opportunities for learners, regardless of their location or time constraints. The college provides high quality, cost-effective educational experiences that emphasize institutional strengths and are responsive to the needs of both on-campus and off-campus learners. ONLINE PROGRAMS - The Business and Information Technologies Division offers two (2) fully online Business Transfer (AA) degrees. The AA degrees are designed to allow students to easily transfer to four-year institutions. Upon completion of the degree, each student would transfer to the four-year institution as a third-year student—junior classification. By coming to the community college first, the student will benefit from a substantially lower tuition for the first two years of their B.S. degree. The Business Administration (5 Core Courses + 9 Hours [3 classes] of Electives) degree is signed for students interested in Management careers and Accounting. The Business Education degree (1 Core Course—21 Hours [7 Classes] of Electives) is for those students interested in all other Business Technology areas other than Management and Accounting such as Sales, Business Teacher Education (High School), Marketing, Health Information Technicians, Health Information Management, Web Designers, Law, Consultants, Insurance Brokers, Entrepreneurship, Computer Science, etc. NOTE: Please remember, since program requirements differ between universities, each student is required to use STARS as a guide in order to adjust (electives) the transferring program to your required needs. Also a GPA of 2.0 must be maintained in the programs. DEGREE/CERTIFICATE PROGRAMS - The following programs are offered in the Business and Information Technologies Division: Business Administration (AA); Business Education (AA); Accounting Technology (AAS); Business Management and Supervision (AAS); Computer Science--Business; Computer Science--Math; General Office Administration (AAS); Legal Office Administration (AAS); and Medical Office Administration [Medical Coding and Billing] (AAS). The Business and Information Technologies Division has partnered with public/private colleges and universities (AA and AAS degrees). Upon entering the four-year institution, your classification should be JUNIOR. Please make sure you meet with your adviser on a regular basis for a smooth transition. We wish all of our graduates a prosperous future!! It is ALL here at Lawson State! DUAL ENROLLMENT - The Business and Information Technologies Division also offers dual enrollment courses. Dual enrollment is a program that allows high school students (usually sophomores, juniors, and seniors) to enroll in college courses for credit prior to high school graduation. College credits earned through dual enrollment can be simultaneously applied toward high school and college graduation and can be transferred to other colleges or universities. SMALL BUSINESS DEVELOPMENT CENTER - The Small Business Development Center provides customized training for business, industry, governmental agencies, etc. The Center assists small business owners and prospective business owners with business plans as they relate to starting and/or maintaining a successful small business. HONORS: Kappa Beta Delta (KBD) is a national honor society which was established in 1997 at the annual conference of the ACBSP to recognize students only in accredited associate degree-granting institutions for their high academic achievement in business programs. A KBD chapter is one of the benefits of ACBSP accreditation and provides a means by which an institution may give lifetime national recognition to its outstanding graduates. 1. Each student must have completed at least 15 hours of credit with a minimum of six credit hours completed in business courses. 2. Each student must rank in the upper 20% of his/her class, based upon a minimum grade point average of 3.0 on a 4.0 scale. What does this mean . . . Lifetime Recognition for Outstanding Academic Achievements. KBD membership provides recognition for a lifetime. As the HIGHEST national recognition an associate candidate in business can earn, it is appropriate to include Kappa Beta Delta membership on one's resume. Employers throughout the country will recognize your academic achievements. Conferences and Conventions - The first student conference was held in June 2007 in Orlando, Florida, in conjunction with the 2007 ACBSP Annual Conference. Networking Opportunities - One of the main objectives of KBD campus chapters will be to advance the career opportunities of members. As members graduate and assume important positions in the business community, they will provide an excellent source of help and guidance for future employment. The chance of alumni and student members of KBD to network with business professionals will place them a step ahead of the employment competition. Public recognition to business students who have distinguished themselves in associate degree business programs. A biennial conference, held in conjunction with the ACBSP annual conference. Scholarships to students based upon scholarship, leadership, character, motivation, need, and potential. KBD publications received throughout members' lifetimes will help them stay in contact with other members and learn about additional opportunities the Society has to offer. Phi Beta Lambda (PBL) is the collegiate division of Future Business Leaders of America (FBLA). PBL is a non-profit 501 (C)(3) student organization devoted to developing competent leaders. We focus on Service, Education, and Progress. Why Join Phi Beta Lambda? Networking, Meet and Speak with Today's Business Leaders. Create those connections that will prove to be invaluable tomorrow. Gain Valuable Leadership Experience. You can serve as anything from a local committee chair to a national officer and everything in-between. The sky is the limit for any dedicated individual. Improve Your Resume - Stand apart from the crowd and show a prospective employer that you know how to go that extra step. Competitions - Strut your stuff against the best of the best across the country. Challenge yourself and go to the next level. Make New Friends - Meet people with similar interests from across the USA.